This new architecture enables you to have many pluggable databases inside a single Oracle Database with this option allows the DBA to consolidate many databases into a single RDBMS installation. At the Oracle Database 11g each instance it is associated with only database. In Oracle database 12c an instance is associated with an entire CDB. In case there are multiple databases on the same server, then there is a separate and distinct instance for each non-CDB or CDB. The instance can not be shared between a non-CDB and CDB (Oracle Database 11g refer with non-CDB like the old architecture). The new 12c, consolidated the databases together in a multitenant container database and a database consolidated within an CDB. 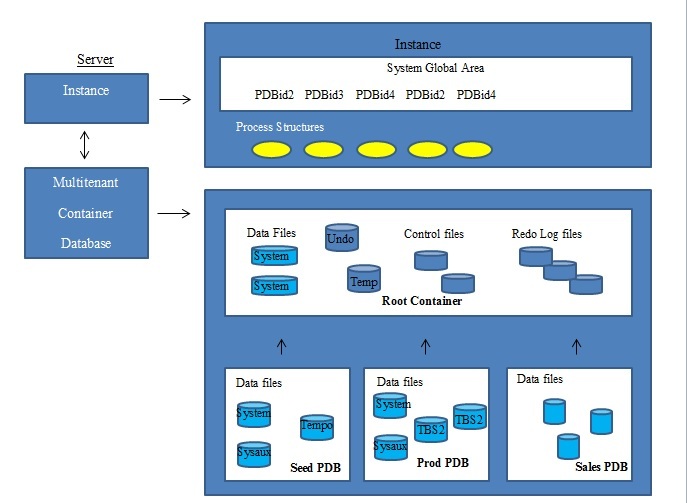 A pluggable database is a set of databases schemas that appears logically to users and applications as a separate database, each pluggable database, has its own dedicated application, and is managed either by its own DBA or by the container administrator that is SYS user of the root container, a common user. This common SYS user can manage the root container and every pluggable database. One CDB is a grouping several applications ends ups with one instance, consequently one set of background process, one SGA allocation and one data dictionary in the root container, common for all PDBs, each PDB maintaining its own application data dictionary. To maintenance for applications patched or upgraded operation is performed only once on the CDB and consequently all applications are updated at the same time. At physical level the CDB has a database instance and database files, just as a non-CDB does. The redo log files are common for the whole CDB. The information it contains is annotated with the identity of the PDB where a change occurs. The control files are common for the whole CDB. The control files are updated to reflect any additional tablespace and datafiles of plugged PDBs. The undo tablespace is common for all containers. A temporary tablespace common to all containers is required. But each PDB can hold its own temporary tablespace for its own local users. Each container has own data dictionary stored in is proper system tablespace, containing its own metadata, and sysaux tablespace. Each data file is associated with a specific container, named CON_ID. This feature brought many innovations at the level from Oracle Database history, bringing more flexibility and more low cost to the companies.